How do the top bulk email verification services compare with each other? What’s the best value in the industry? Read on to discover the answers. Bulk email verification may be confusing for people who are new to the market. For example, there are many different prices in the marketplace. Is paying extra worth it? Does it get you better service? Email verification software tests the validity of email addresses. Invalid emails are a monumental problem for businesses. If you send to invalid email addresses, your email reputation score goes down. If your email reputation score goes down, your emails will reach fewer inboxes. These days, you don’t have to download any software to verify your emails. Right now, virtually all bulk email verification is done with hosted software. Why Is Email Verification So Important? Bulk email verification is designed for businesses that want to clean their email list. Individual email verification is catered toward individuals that want to validate a handful of emails. Bulk email verification is fast. 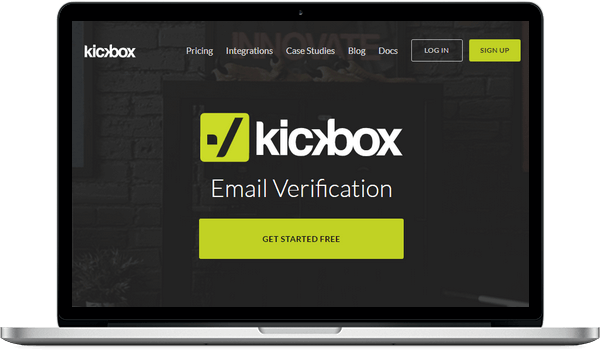 You can verify thousands of emails in minutes. Conversely, individual email verifiers compel you to insert one email at a time, and often they een have reCAPTCHA codes. That’s why business owners (and people with large lists) prefer the speed and accuracy of bulk email verification. There are a large number of bulk email verification companies out there. We rigorously studied the industry and picked the five best ones (based on the features marketers care about). Here’s a comparison of the top bulk email providers, which will help you identify the email verifier that best fits your requirements. You’ll find at least 20+ bulk email verification services online. Some companies have a nice and shiny website, but behind the glitz and glamour, they don’t have quality service. The tools we review in this comparison are tested, reliable and trusted email verifiers. Therefore, if you choose ano fo them, you will most probably be satisfied with the service. On the other hand, using an untrustworthy tool may result in you losing your data, wasting your money, and failing to comply with the GDPR. According to Constant Contact, email marketing has higher conversion rates than search and social combined. Your email list is your most valuable asset. Make sure you protect it with high-quality email verification software. 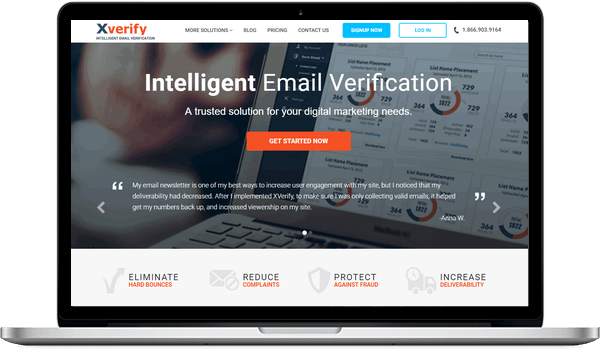 EmailListVerify is one of the leading services on the market, putting emphasis on simple user interface and quality customer support. It offers the best value for money as it combines elite features with extremely competitive pricing thanks to the intelligent optimization of resources. 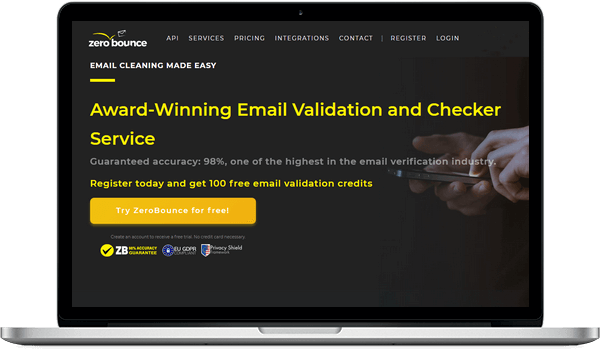 ZeroBounce is a popular email verification solution and one of the industry leaders. One of its most interesting features is the email address scoring system based on the artificial intelligence. KickBox is a well-established company that offers stadard features and high quality of data. One of the disadvantages is that it does not provide an automatic removal of duplicate emails. Brite Verify is one of many tools by the Validity company offering data solutions for business. The main disadvantage of this service is its high-end pricing. Xverify is a long-term player on the email verification field, offering quality services. However, the tool lacks some basic features such as online chat support or free trial of the service. Email verification ensures that you only send email messages to real people. Here are seven practical perks of email validation software. Believe it or not, spam filters and ISPs keep close track of a metric called email sender reputation. They use complex algorithms to determine whether or not you’re a spammer. Sending messages to invalid email addresses badly lowers your personal reputation score amongst these algorithms. Once your email sender reputation is damaged, it’s hard to recover. There isn’t a sure-fire way to repair a bad email sender reputation quickly. Email verification software keeps Pandora’s Box closed. In other words, it keeps your score high and prevents problems. That helps you reach more people on your email list. According to the Direct Marketing Association, email marketing has a ROI (return on investment) of 4300%. It’s the most profitable tool in your toolbox when used correctly. Of course, you won’t get the most out of email marketing if you have low email deliverability. And you will have low email deliverability if you send to invalid email addresses. 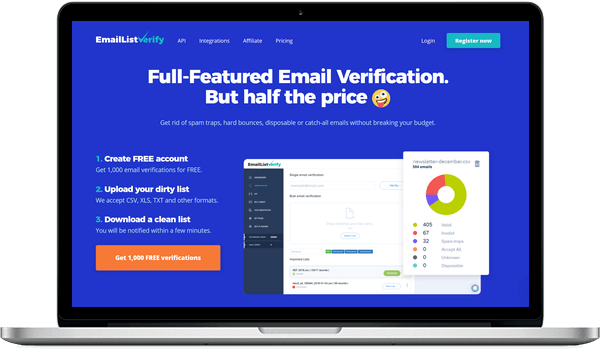 Email verification keeps your list clean, which helps you deliver more emails, which makes you more money. Email marketers work with ESPs like MailChimp, Aweber, GetResponse, and others. These are major players in the ESP world. For instance, MailChimp has over 15 million users, and these users send over 1 billion emails every day. How does MailChimp (and many of its rivals) charge? Let’s take a look at MailChimp’s pricing index. As you can see, ESP’s like MailChimp charge per subscribers, not per emails sent. ESP’s often give you unlimited sends to a select number of subscribers. Only paying for valid email addresses keeps you in a lower bracket. Therefore, email verification keeps money in your pockets and out of the ESP’s pockets. As you know, “a penny saved is a penny earned.” However, in this case, the savings can add up to hundreds of dollars a year. According to Hubspot, there are 6 email marketing metrics that every business needs to track. These metrics are clickthrough rate, conversion rate, bounce rate, list growth rate, email sharing rate, and the overall ROI of the campaign. How to calculate these metrics is beyond the scope of this article. Yet, all these metrics have one vital point in common. They are all distorted by the invalid emails on your list. If your stats are dragged down by bad emails, it will make apples-to-apples comparisons with other companies in your industry difficult. 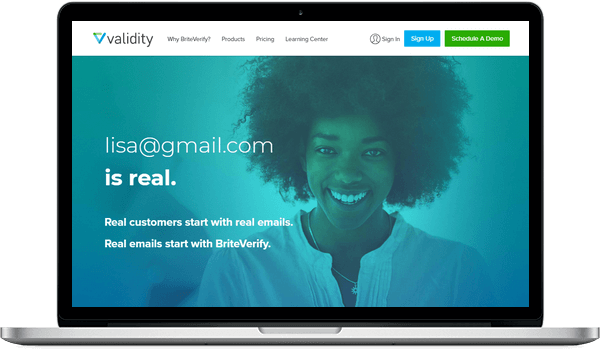 Email verification software sheds bad emails, giving you more useful data.  The bounce rate is one of the most common elements that ISP’s and ESP’s look at. According to Campaign Monitor, a bounce rate above 2% is worth your attention. Spammers have notoriously high bounce rates. Indeed, elevated bounce rates and spammers go together like peanut butter and jelly. Therefore, if you have a high bounce rate you’ll look like (and be treated like) a spammer. Email verification software deletes hard and soft bounces from your email list. Spam traps are email addresses used by the ISP’s and anti-spam lists to identify spammers. Spam traps won’t be on your list if you follow best email practices to the letter. However, many businesses fall short of strictly adhering to best email practices, and spam traps end up on their list. Notably, if you send to a spam trap, you probably won’t know you did it. That’s because spam traps don’t bounce like many other types of invalid emails. Elite email verification software uses advanced technology to remove spam traps from your list. Some email users are chronic complainers. They use the “spam button” instead of the unsubscribe button. They often complain directly to ISP’s like Yahoo and Google. You don’t want chronic complainers on your list. According to Campaign Monitor, the industry standard is 1 complaint for every 5,000 recipients. Any higher than that, and you’ll attract unwanted attention. As you can see, even a microscopic handful of complainers on your list is undesirable. Top-notch email verification uses special technology to eliminate complainers from your list and keeps you under the strict threshold that ISP’s desire. Bruce Lee has a fascinating quote beloved by motivational speakers. He once noted, “The successful warrior is the average man, with laser-like focus.” That concept applies to email lists too. The successful email list has a laser-like focus. It isn’t bogged down with spam traps, complainers, and inactive accounts. Those addresses are draining your funds, not replenishing them. Email verification isn’t all you need for a healthy email marketing strategy. It won’t replace email marketing best practices. Still, it’s a powerful tool, a device with impressive utility for many marketers. Do you use email verification? If so, what’s your favorite company? Is it one of the brands above, or do you use someone else? Let us know in the comments.